from around the world having made these Islands their home. self-governance, whilst recognising mutual responsibility and a pledge of UK support when needed. As a modern, self-governing Overseas Territory of the United Kingdom, we determine our own future. the people of the Falkland Islands to represent them and to make our own policies and legislation. way how our people wish to live their lives. have been set as Sunday the 10th and Monday 11th March, 2013.
democratic right. Freedom of expression and association are rights enshrined in the Falkland Islands Constitution. The Falkland Islanders are a peaceful, hard-working and resilient people. Our society is thriving and forward-looking. as the people of the Falkland Islands declare publicly their chosen political direction. 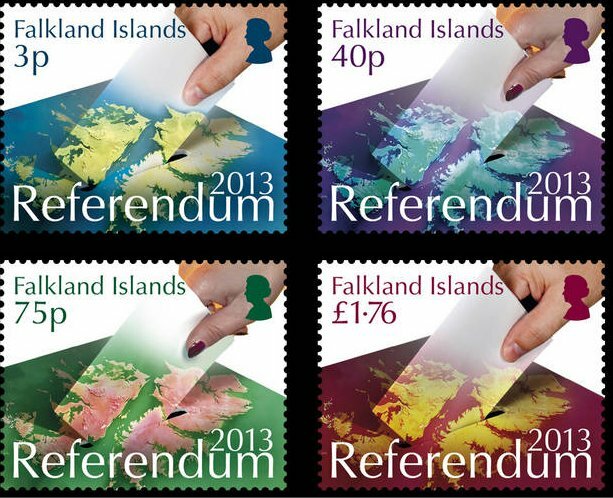 There will be four stamps with values 3p, 40p, 75p and £1.76p which cover a wide range of postal rates. hands) inserting a vote into a ballot box which carries a design showing the islands. the border together with the statement 'A peoples' right of self-determination is a fundamental modern democratic right'.